Clavarioidia clavarioides (Pfeiff.) Kreuz. in Werderm. Verzeichnis Amer. Sukk. Rev. Syst. Kakteen Verzeichn. (1935); cf. Werderm. in Fedde, Repert. Sonder-Beih. C. sub t. 97(1935), in obs. 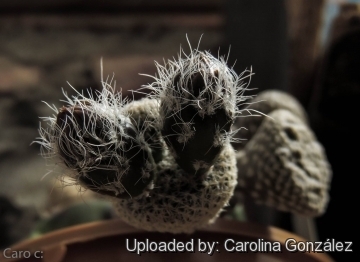 This is surely one of the most peculiar cacti. It blooms on and off during the summer. 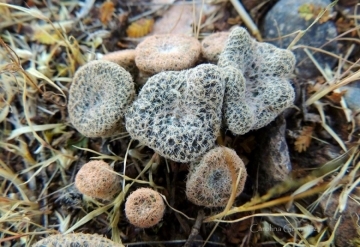 Origin and Habitat: Puna clavarioides is the type species of the genus Puna and cames from the provinces of Mendoza and San Juan in Argentina. The species has an extent of occurrence of approximately 3,000 km2. Altitude range: It is a high altitude cactus that grows at altitudes between 2,000 and 3,000 metres above sea level. Habitat: This species grows in high-altitude steppes and monte shrublands in an extremely arid environment. It is found well camouflaged on rocks and sands among scattered shrubs or grasses, but often in barren places where no other kind of vegetation can survive. 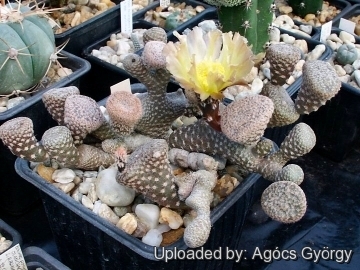 This small cactus is difficult to find due to its size; it mimetizes well with surrounding rocks. It seems to be rather abundant where it occurs. There are several roads crossing its range. Current and projected mining activities, as well as tourism are also threatening the species. Extraction by collectors is considered low risk, as it is difficult to find and occurs in areas of difficult access. Austrocylindropuntia clavarioides (Pfeiff. ex Pfeiff.) Backeb. Cereus clavarioides (Pfeiff.) hort. ex Pfeiff. Opuntia clavarioides Pfeiff. in Pfeiff. ex Pfeiff. Austrocylindropuntia clavarioides var. ruiz-lealii (A.Cast.) Backeb. Opuntia clavarioides var. ruiz-lealii A.Cast. 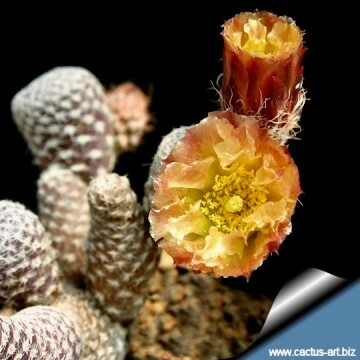 Description: Maihueniopsis clavarioides, more commonly known as Puna clavarioides or Opuntia clavarioides, is a low growing geophyte cactus consisting of clusters of subterranean greyish brown conical or club-shaped stems, arising from large, swollen roots. In the wild it grows with just the tops of the stems exposed above ground. In cultivation this plant takes on a much different character than its wild brethren. To grow the plant like it is in habitat we would need to start out with a seed and a deep pot, since this strange and wonderful plant does something few cactido: when the seed germinates it throws down a root first thing, and when the root gets deep enough it begins to make a tuber to store water for hard times. (Life in habitat is hard all the time). The part of the root above the tuber becomes what is called the neck, which connects the deep, tuberous roots to the aboveground heads of the plant. Several new cone-shaped stems emerge and grow each year from the top of the neck. At summer's end the underground parts of the plant contract, and since the stems cannot enter the soil, they break off, shrivel and get blown away. Distinguishing characters: Areoles elliptic, with short, pectinate spines, areoles of fruit generally without glochids (simplified areoles on the pericarpel), showing just a few hairs in the axil of a triangular scale, fruits dry, indehiscent; characteristic seeds, cotyledons up to 60% of the length of the embryo. Stems (joints): Short greyish to dark brownish 2-3(-4) cm high, 1.5 cm in diameter, not tuberculate, rather fragile, cylindrical to obconical, sometimes with flattened-truncate faces apically or cristate at apex an little branching. The typical form has distinctive conical segments with the growing centre at the widest flat end of the cone, but monstrous forms with cristate fan-shaped or clavate finger-like stems are widely seen in cultivation. Sometimes all three of these stem forms may be seen on a single plant. Leaves: Minute, 1.5 mm. long, reddish, deciduous as new growth matures . Areoles: Minute, numerous and crowded on upper parts of segments, infrequent below., filled with wool and minute spines. Spines: 4 to 10, white, pectinate and flattened against the surface. Flowers: Borne laterally, yellow green to olive green, ca. 4 cm long; sepals linear, pointed, reddish; petals light brown, narrowly spatulate, slightly crenate; ericarpels without developed areoles but with small scales-like leaves bearing short hairs and bristles in their axils, especially near the rims; filaments white, shorter than the petals; style white, with 7 stigma-lobes. Fruit: Ellipsoid to pear shaped, dry, dehiscing irregularly, 1.5 cm long, one-seeded. 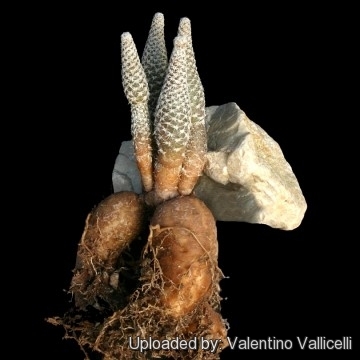 Remarks: Variety cristata is offered in the trade journals. Maihueniopsis clavarioides (Otto ex Pfeiff.) 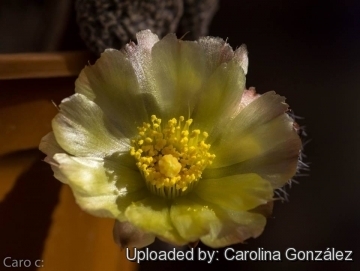 E.F.Anderson: Small creeping cactus that forms short distinctive conical segments with the growing centre at the widest flat end of the cone. 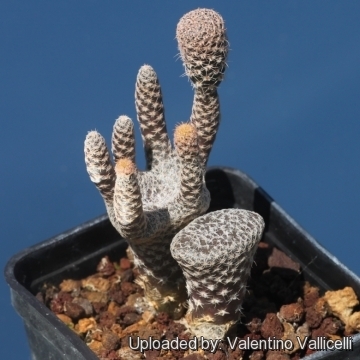 Maihueniopsis clavarioides f. cristata: This plant produces fan-shaped (crested), conical and finger-like stems in an unpredictable manner, sometimes all three of these stem forms may be seen on a single plant. 5) Méndez, E., Trevisson, M., Perea, M., Demaio, P. & Lowry, M. 2013. 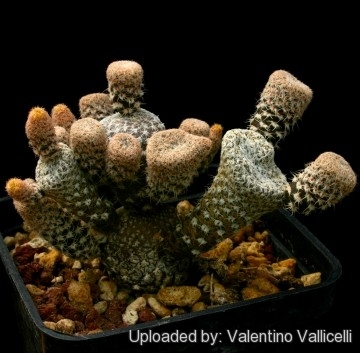 Maihueniopsis clavarioides. The IUCN Red List of Threatened Species. Version 2014.3. <www.iucnredlist.org>. Downloaded on 11 April 2015. 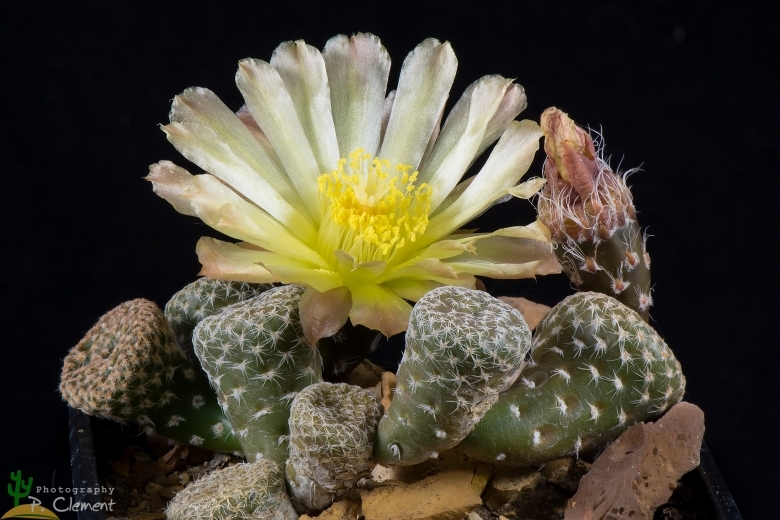 Cultivation and Propagation: This mountain cactus - because of the elongated fat taproot - necessitate deep pots and a well drained mineral potting mix. Need a sufficient amount of air. They are susceptible to overwatering, but need enough water during vegetation and require a dry winter rest. Frost Tolerance: They tolerate light frost -5 (-10) °C. Need to be kept in a cool place during winter rest this is important for the flowers as well as for their health. Without this cool winter period they normally wont get many buds. Sun Exposure: Need a good amount of sun. Propagation:: Usually propagated by cuttings and grafting . Grafted plants in culture are most common and sprout strongly. But it is also feasible to root them but they grow much slower on their own roots and takes various years prior to they bloom.